Bruce Odland (left) and Sam Auinger performing at District Hall on Friday. In his Epistles, the poet Horace decried the constant din of first-century-BC Rome: “Would you have me, amid so great noise both by night and day, try to sing?” But sing he did. A similar tension energized “my eyes . . . my ears . . . ,” the performance by O+A (sound artists Bruce Odland and Sam Auinger) at District Hall on Friday, sponsored by the Goethe-Institut and Non-Event. The exploration of the city’s sonic wallpaper was framed as advocacy, but the piece was also an aesthetic statement — often a paradoxically beautiful one. Part soundtrack, part documentary essay, part theater, “my eyes . . . my ears . . . ” emphasized questions over answers. 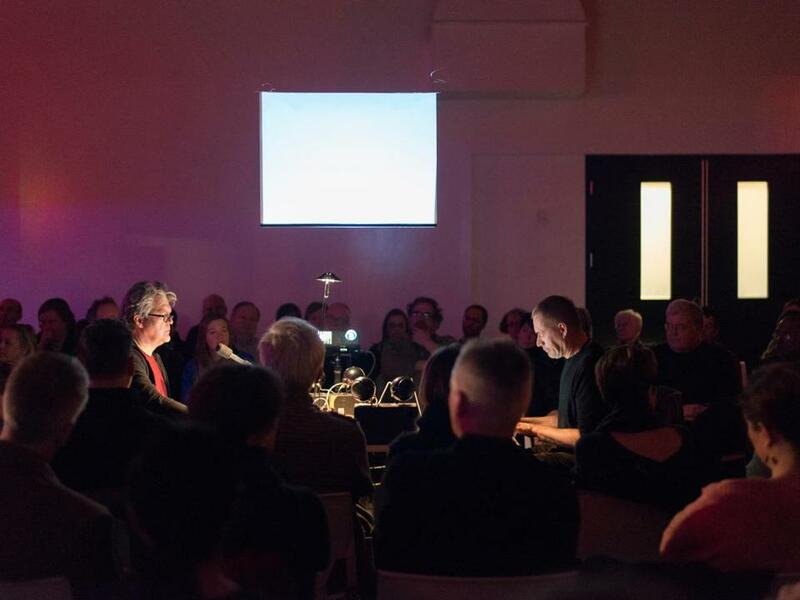 While Auinger digitally tuned the quadraphonic soundscape, images passed across a trio of screens: snapshots and video of the pair’s tours, on foot and by car, through various urban environments. Odland, narrating into a desk microphone, took a Virgilian role: commenting, conversing with his on-screen double, scribbling in a notebook, offering a running gloss of wry observations and provocative interrogation, as the sounds (subway trains, tires on pavement, hard echoes of steel and glass) rumbled and roared. The piece circled repeated motives. A sound check: snapped fingers establishing spatial reference and synchronization, but also existential echolocation. “Standing waves”: the city’s omnipresent but unnoticed industrial hum. Aural and visual disassociation: fragmentary video and still images (at least until the latter were abandoned due to a technical glitch) reversing the usual polarity of sight over sound. And the transition from outside and inside — the car as “an exoskeleton,” as Odland put it, a shell against its own created environment; the pair, on video, repeatedly entering District Hall itself from off the street, crossing from an uncontrolled sonic environment to a controlled (but no less alienating) one. The centerpiece was a walk through a Brooklyn, N.Y., park, the two noticing everything they could see but not hear over the scrim of cars and trains, other visitors to the park defaulting to activities privileging sight over sound.